Careful With That Axe, Eugene: Fame at last - my Blog is a "Fluffy Link" today! 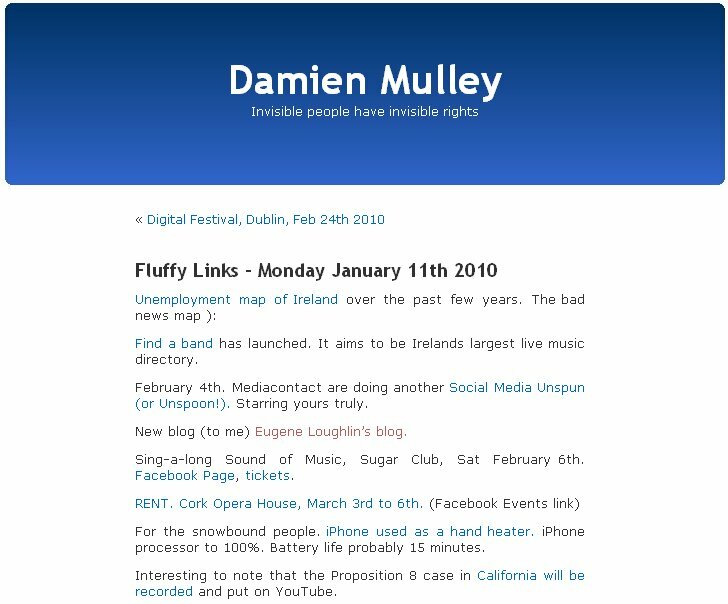 One of Ireland's leading bloggers and all round expert at everything WWW, Damien Mulley, added my blog as a Fluffy Link in his daily post today. 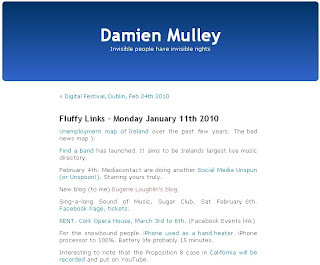 Damien is a regular on radio and TV where he expertly articulates his opinions on what is good, bad, the latest, and greatest about the Internet. I wrote previously that I attended his presentation to the Institute of Business Analysts and Consultancy. I have Damien's Fluffy Links in my Google Reader and I check them out almost every day. It's a great way to keep up with what Damien is doing, and to also check out his convenient posts about the wonderful and the weird of the WWW. I'm delighted that he added me as a "Fluffy Link", though I will forgive him getting my name wrong, he left out the O' (Oh apostrophe) - something us O'Loughlins and other "Oh apostrophes" can get a little fluffy :-)) about. I'm curious about how he came across my Blog. Google Alerts may be responsible as I referred to him in my Leningrad Cowboys post last week. So Damien, if you are reading this - thanks for the plug, and keep on rockin' the Web.